The Element II can be operated as an air computer, nitrox (EANx) computer, digital depth gauge/timer or as a free dive depth gauge/timer. The IQ-750 offers several desirable features including: Water-activation, 2 mix gas switching ability, a large alphanumeric and backlit display, audible and visual alarms, advanced user safety settings, and PC download/upload. Computer is powered by a user replaceable CR2450 lithium battery. TUSA Algorithm is based on Buhlmann ZHL-16c Pelagic Z+ model a modified Haldanean 12 compartment algorithm. Computer features include a maximum depth display of 399' (120 meters), imperial or metric units, temperature, 12/24 hour format, pre-dive plan mode from 30'-190' (9-57 meters), time to fly and de-saturation countdowns, 24 dive log memory function and more. The TUSA Element II dive computer features a deep stop function for additional safety. The deep stop mode is activated when a dive exceeds 80' (24 meters) for more than 1 second. Upon ascent past 50' (15 meters), the computer will display a deep safety stop screen and the recommended stop at 40' (12 meters) for a period of 2 minutes. This deep stop is highly recommended as additional opportunity to off-gas, but is not mandatory. If the diver chooses not to serve the stop it will not adversely affect the remaining no-decompression limits of the dive. 2 Gas Mix: This feature allows the diver to preset two Nitrox gas mixtures (Mix 1 and Mix 2) for easy switching during the dive as necessary. Mix 1: 21 to 50%, Mix 2: 21 to 99%.The altitude smart mode allows the computer to automatically adjust for altitude diving. Computer will adjust altitude from 0' to 14.000' (0 to 4,270 meters). 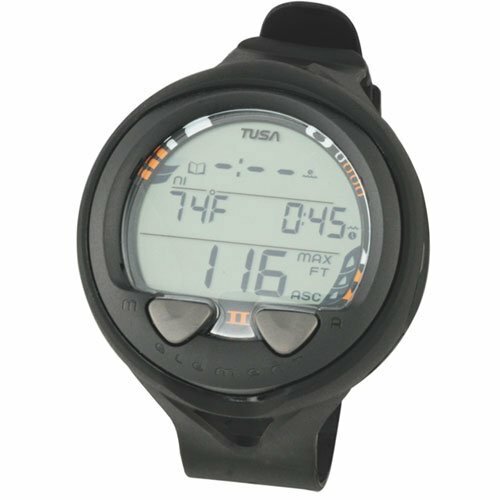 TUSA's computers feature audible and visual alarms for the most important dive data warnings. Ascent rate, maximum depth, no decompression limits, safety stop and several other key data can be set to alert the diver. Computer feature a backlit display for night diving or low-light situations. The bright backlight is activated by a touch of a button and the duration can be set for up to 10 seconds in length enabling the diver to view critical dive data easily and quickly. 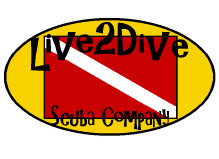 TUSA's PCLogbook and TUSA DataLog PC interfaces allow the diver to transfer complete log and profile history from the dive computer to a personal computer or upload user settings to the computer. A PC interface unit is sold separately. Computer is housed in a sturdy, durable and impact resistant rubber wrist boot with wrist strap, comes with a spare battery and owner's manual.